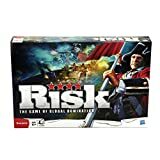 Australia is a right continent to control at the beginning of the game (because it's easy to hold) and get the continent bonus. South America, with only two points of attack, is almost as good. You should try to get a card every turn. Therefore you must invade at least one territory to take a card at the end of a turn. If you don't have an immediate agenda, attack a territory that's undefended with armies or maximum one or two armies. Avoid big losses. Never let other players see your cards. Use them also for bluffing and avoid to trade in your cards too early. Do not spread yourself too much if you don't have enough army. Other players can sweep through and capture easy all your one-army territories. Always try to attack with a large army rather than a medium-sized one. It is often better to attack first then waiting for the enemy to build up more troops and attack when he has the advantage. 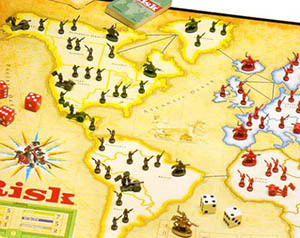 Risk is not a team game, so alliances with other players are always temporary. If you're playing with increasing card redemption values, hold your cards as long as possible. Even if you're playing with mission cards, it's generally better to go first after a full continent. When you try to complete a mission, make sure it doesn't get obvious what your goal is. To defend a country, you can have an option of how many dice to roll, then roll as many as possible because this increases your chances of defense. 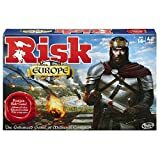 There are various versions of Risk, so be sure that you're not playing the same rules/game while everyone else is playing others. The road to victory usually starts on the southern hemisphere. In a game using mission cards, you shouldn't focus much on your mission at the start. Focus on missions after 4-5 rounds. If you take risks, take calculated risks. Don't relay too often on luck. Suicide missions lead not often to success.